Everything about IT: Configure Domino to ignore whitespace during quota check. Configure Domino to ignore whitespace during quota check. When you have set quotas for your mail files on a server with transaction logging enabled (I really hope everyone has logging enabled.) your users have the problem, that after they have deleted some mails there is no possibility to remove the whitespace from the database, because the option to compact is not available for databases which are transaction log enabled*. So many admins run "compact -c" regulary on all mail files to remove whitespace. But from a performance point of view copy style compacts are a really bad idea (I will provide more infos on this in a future blog post). 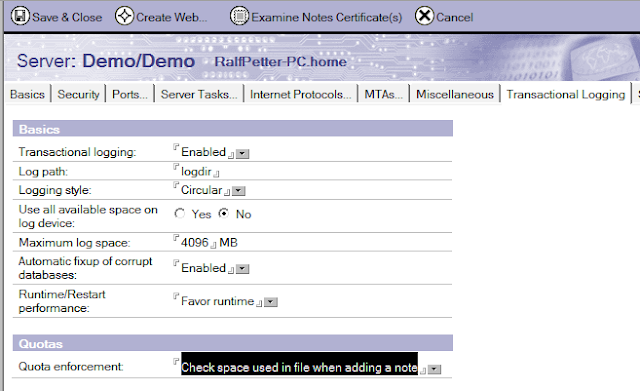 So the much better way to solve the problem is to change the "quota enforcement" setting on the "Transaction Logging" tab in your server document from the default "Check file size when extending the file" to "Check space used in file when adding a note". With this setting the white space is ignored on quota calculation and your users are happy again. * The compact for user is disabled, because a copy style compact will generate a new DBIID and a change of the DBIID of a database make a new full backup of this database necessary.